Leaf is one of the most common biomass wastes. It is easy to obtain large quantity of leaves in autumn and winter in your house and yard. You may make great efforts to deal with it, or discard it carelessly. Why not use them as fuel? They can save your cost for home heating in winter. With a leaf pellet mill, you can process the bulky leaves into leaf pellets and use them in your heating stove. Leaves are abundant. They are easy to get and the cost is rather low. Leaves is a high-fiber material. It is easy to made into pellets with high intensity. Leaves burns sufficiently and evenly, with high calorific value. Burning leaves generate little smoke or ash. It doesn't take much work to clean. Biomass are carbon-neutral energy. They can reduce greenhouse gas emission and air pollution. Why should you make leaves into leaf pellets? The density of bulky leaves is 180kg/m3, while the density of leaf pellets is at leat 650kg/m3. Leaf pellets take up only 1/4 of the room bulky leaves occupies. High density makes leaf pellets easy to store and transport. Leaf pellets has longer burning time and higher burning efficiency. As the leaf pellets are uniform in size and density, they are convenient to use in heating stoves. We can control the firepower by adjusting the fueling speed. The process to make leaf pellets will eliminate the ash and impurities in the leaves, and remove the extra moisture. This process can not only improve the burning effect of biomass, but reduce coking in the heating stove, reduce cleaning work, and ensure safety. 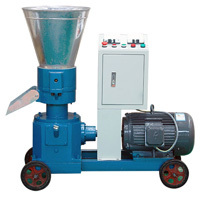 TICO leaf pellet mill can make biomass materials into wood pellets. It adopts flat die design, small and portable, with four wheels that allows you to move it to anywhere. The production capacity is 800kg/h at most, suitable for home use and small-scale production. Low cost and low power consumption makes it affordable for most personal users. Scientific design and durable component ensure its high efficiency and long service life. Except for leaves, TICO flat die pellet mill can process various biomass materials, such as crop straw, rice husk, cotton stalk, sawdust, wood shaving, grass, twigs, barks, etc. The biomass pellets can be used in home heating stoves, boilers, and for industrial heating. Besides, the pellet mills can make animal feed into pellets to improve the taste and nutrient, or make bedding pellets in animal houses. How are leaf pellets made? 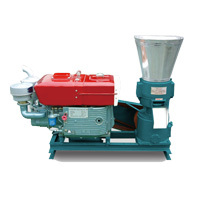 After you put the crushed leaves into the pellet mill, the roller form high pressure to them and squeeze them to the holes on the flat die, in which the bulky leaves are formed into solid cylindrical pellets. A knife under the flat die will cut the leaf pellets off. Then you can collect the leaf pellets with a container. How to make leaf pellets? It is easy to make leaf pellets with a pellet mill, but you should pay attention to the following tips. Before feeding leaves to the pellet mill, you should crush them into the size under 5mm, or they would block the pellet mill and affect the production. Newly fallen leaves contain perfect moisture for making pellets. But for green leaves or those have been kept for some time, you need to dry or wet them to keep the moisture content between 10%-15%, or they will be hard to form and easy to break. It is recommended to add some sawdust to the leaf materials to make pellets. The lignin in leaves are not enough to bind the pellets firmly. With some sawdust, the leaf pellets quality will improve greatly. Preheat the pellet mill before putting in raw materials. Feed oil mixture (3-5kg raw materials and 10% waste oil) to the pellet machine repeatedly under the flat die and roller heat up. The pellets may have some cracks in the beginning, but they will be perfect after a while. If you don’t use the leaf pellets immediately, you can store them in bags and keep them in dry places to prevent water.